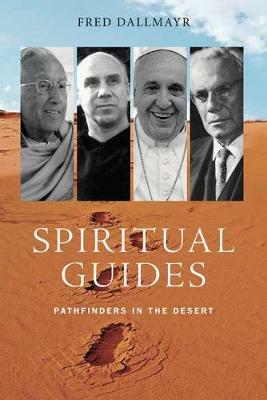 In Spiritual Guides: Pathfinders in the Desert, Fred Dallmayr challenges the "desert character" of modern culture. Political and economic corruption, incessant warmongering, spoliation of natural resources, and, above all, mindless consumerism and greedy self-satisfaction are all symptoms of what he contends is an expanding wasteland or desert where everything creative and nourishing decays and withers. Through an alternative interpretation of Nietzsche's saying "the desert grows," this book calls for spiritual renewal, invoking in particular four prominent guides or pathfinders in the desert: Paul Tillich, Raimon Panikkar, Thomas Merton, and Pope Francis. What links all four guides together is the view of spiritual life as an itinerarium, a pathway along difficult and often uncharted roads. Dallmayr begins by drawing a connection between Nietzsche's characterization of the desert in Zarathustra and the present culture of consumerism, in which a nearly-exclusive emphasis on productivity, efficiency, profitability, and the transformation of everything valuable into a useful resource prevails over all other goals. He also draws attention to another sense of "desert," namely, as a place of solitude, meditation, and retreat from affliction. Aptly defined, it becomes a place where spirituality arises from a painful "turning-about": a wrenching effort to extricate human life from the decay of late modernity. Spirituality is not a possession or property but rather the contemplation and radical mindfulness that we develop through engaged practices as we search for pathways to recovery. Spirituality becomes critical in the dominant political and cultural wasteland because it provides a bond linking humanity together. In the spirit of global ecumenism, Spiritual Guides also includes a discussion of Muslim, Hindu, and Buddhist forms of spirituality. This book will interest students and scholars of philosophy, political theory and religion.